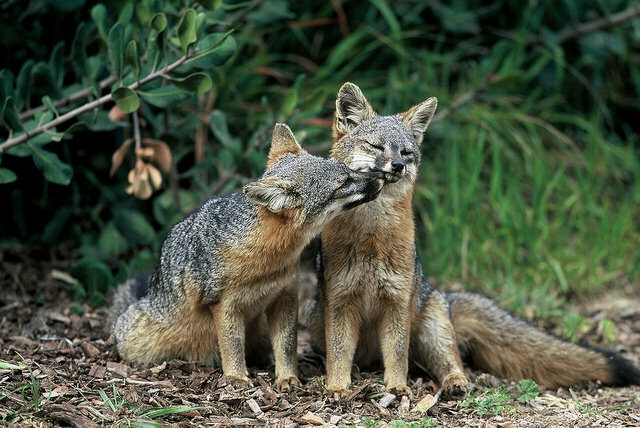 California Island Foxes, Photo: Pacific Southwest Region U.S. Fish and Wildlife Service. Biologists are calling it the fastest recovery for any mammal listed under the Endangered Species Act. According to a report from the Washington Post, the subspecies of fox living on the Channel Islands, off the coast of Southern California, were in serious trouble due to pressure from predators, competition and human activity. Scientists feared that their rapidly plummeting numbers would lead to their inevitable extinction. Across four islands, the foxes’ population dropped to fewer than 200 by the late 1990s. In 2004, they were officially declared endangered by the federal government. Researchers pin the decline largely on golden eagles, which were attracted to livestock brought by settlers in the 19th century and developed an appetite for the tiny foxes. So how did the ecologists restore the population of foxes throughout the Channel Islands? For starters, populations of animals on islands are small and isolated compared to their mainland counterparts. The recovery of the island foxes can be largely attributed to cooperation between multiple groups including the USFWS and the Nature Conservancy. Together, these groups addressed the ecosystem imbalance and carried out efforts to trap and breed foxes throughout the islands, to kill more than 5,000 predatory feral pigs, and to trap predatory golden eagles and relocate them to the mainland. Ecologists also re-introduced bald eagles back into the islands, which were previously wiped out with DDT. Bald eagles’ preference for fish over fox meat relieves pressure on the tiny canines, allowing them to breed more freely. Today, more than 6,000 foxes populate the Channel Islands.